You are on Getting To The Hospital. Skip to the next section. 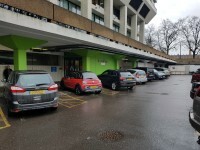 St Thomas' Hospital car park is located on Lambeth Palace Road, London. 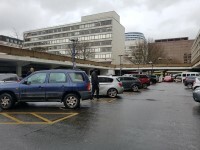 St Thomas' Hospital is located in the Congestion Charging Zone and parking is very limited. Please use public transport whenever possible. 12, 53, 148, 159, 211, 453, C10 - stop at Westminster Bridge Road 77, 507, N44 - stop at Lambeth Palace Road 3, 344, C10, N3 - stop at Lambeth Road (15 minutes' walk) 76, 341, 381, RV1 - stop at York Road The Shell building development on York Road, due for completion in 2019, means visitors to St Thomas’ are being directed to the end of York Road. For St Thomas’ main entrance, turn right after using the pedestrian crossing at the end of York Road and the hospital is directly ahead. N44, N155, N159, N381 - Night buses stop at Westminster Bridge Road. Waterloo and Waterloo East are the nearest railway stations and are a 10-15 minute walk away. Victoria and Charing Cross are 20–30 minute walk away. Westminster - District, Circle and Jubilee lines (10 minute walk) Waterloo - Bakerloo, Jubilee and Northern lines (15 minute walk). For information about getting to Guys Hospital please see the link below. 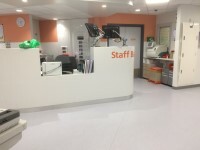 For information about getting to St Thomas' Hospital please see the link below. For information on London Bus services please see the link below. For information on London Underground services please see the link below. There is a Patient Advice and Liaison Service (PALS) at the hospital. The Patient Advice and Liaison Service (PALS) is located in the main hospital foyer. The telephone number for the Patient Advice and Liaison Service (PALS) is 020 7188 8801. The email address for the Patient Advice and Liaison Service (PALS) is pals@gstt.nhs.uk. There are volunteers available for help and assistance at the hospital. Volunteers can be found at information points around the hospital. Volunteers do receive disability awareness / equality training. Hospital staff do receive disability awareness / equality training. Hospital staff and volunteers receive deaf awareness training. 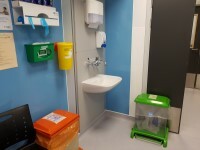 There is an assistance dog toilet or toileting area on the hospital site. The assistance dog toilet or toileting area is located outside the main entrance. BSL interpreters can be provided on request. Mobility aids are available to help patients move around and include; wheelchairs. If you require any additional information or assistance, please speak to a member of staff. Additional hospital services link (new tab) - click here. You are on Hospital Parking. Skip to the next section. The hospital does have a dedicated car park. 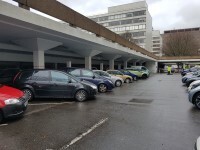 The car park is located at the front of the hospital. The car park does have a barrier control system. Controls at the barrier are within the range of 100cm to 110cm. There is a/are clearly marked/signposted Blue Badge parking bay(s) available. The dimensions of the designated Blue Badge parking bay(s) surveyed are 422cm x 547cm (13ft 10in x 17ft 11in). The dimensions of other designated Blue Badge parking bay(s) vary in size. Parking spaces for Blue Badge holders do need to be booked in advance. There is a designated drop-off point. The drop-off point is located outside Gassiot House Outpatient Centre. There is not a dropped kerb from the drop-off point. There are parking charges for the hospital car park. Payment signs are located at the payment machines in the car park. Payment signs do not make it clear if parking charges apply to Blue Badge holders. Parking is not free for Blue Badge holders. Payment machines are located outside both North and Lambeth Wing Lower Ground floor entrances. There is a payment machine at a convenient height for wheelchair users. 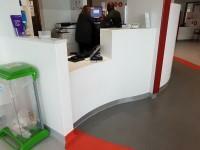 There is a level turning space (minimum 185cm x 210cm) in front of the payment machine(s). To see the hospital parking charges please click here (opens new tab). 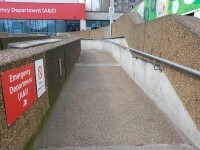 The route from the car park to the entrance is accessible to a wheelchair user unaided. The hospital entrance is clearly visible from the car park. 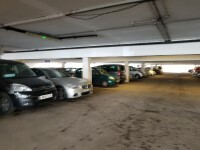 The nearest designated Blue Badge parking bay is approximately 5m (5yd 1ft) from the North Wing Lower Ground entrance. Parking at Guy's and St Thomas' hospitals and the community services is very limited. Both of the hospitals and many of the services are located in the Congestion Charging zone. Please use public transport whenever possible. If you're a disabled patient attending an appointment, you'll be given free parking in the main car park upon production of your Blue Badge (registered in your name) along with your appointment card/letter. 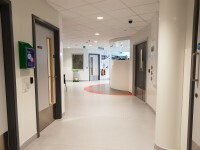 Please take your Blue Badge (leaving the clock on display if parked in a disabled bay, white entry ticket to the car park and appointment letter/card to the Knowledge and Information Centre (KIC), which is located on the ground floor of St Thomas', North Wing. The KIC is open from 8am to 6pm. Outside these hours, please go to the security desk at the main reception. You are on Outside Access (Accident and Emergency Main Entrance). Skip to the next section. This information is for the entrance located at the side of the hospital. The entrance area/door is clearly signed. The entrance door(s) does not/do not contrast visually with its immediate surroundings. The door(s) is/are double width. The width of the door opening is 163cm. The width of the door opening is 184cm. The ramp/slope is located to the left of the entrance. 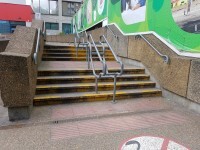 There is a/are handrail(s) at the ramp. The handrail(s) is/are on both sides going up. The step(s) is/are located to the right of the entrance. There is tactile paving at the top and bottom of the step(s). The step(s) is/are clearly marked. The handrail(s) is/are in the centre going up. You are on Entrance (Majors). Skip to the next section. This information is for the entrance located at the rear of the Accident and emergency department. The entrance area/door is clearly signed with the name of the service/department. The width of the door opening is 214cm. 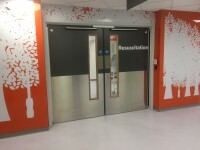 You are on Entrance (Resuscitation). Skip to the next section. The width of the door opening is 117cm. 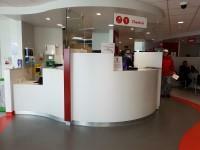 You are on Reception (Check-in desk and Main Reception Area). Skip to the next section. The reception point is located ahead on entering the department. 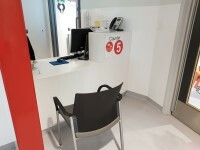 The reception point is approximately 4m (4yd 1ft) from the Emergency Department Entrance. The reception area/desk is clearly visible from the entrance. 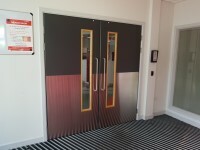 There is step free access to the reception point. There is a clear unobstructed route to the reception point. There are no windows, glazed screens or mirrors behind the reception point which could adversely affect the ability of someone to lip read. The reception counter is not placed in front of a background which is patterned. The lighting levels at the reception point are good. The height of the reception counter is high (110cm+). There is sufficient space to write or sign documents on the counter. There is a low section of the counter (76cm or below) available. 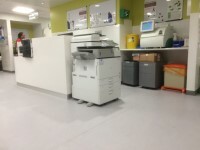 There is sufficient space to write or sign documents on the low section of the counter. There is not a clear knee recess beneath the low section of the desk with the recommended dimensions of 70cm (height) x 50cm (depth). The type of system is a portable loop. The hearing system is available only on request. The hearing assistance system is not signed. Signs and universally accepted symbols or pictograms, indicating lifts, stairs, WCs, circulation routes and other parts of the building are provided in the reception area. 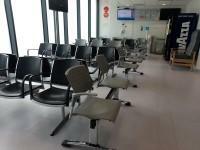 There is a waiting area close to the reception point. Access to the waiting area is unobstructed. The type of flooring is vinyl/laminate. 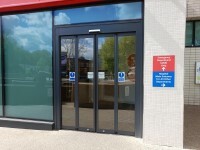 There is sufficient space for a wheelchair user to use the waiting area. There are seats with armrests on both sides. No tables are permanently fixed. The waiting room / area does not have background music playing. There is not a flashing fire alarm beacon within the waiting room / area. The vending machine controls are not within 120cm (4ft) from floor level. A water dispenser is available. There is not a play area or toys/books for a child to play with. There is space for an assistance dog to rest within the seating area. You are on Reception (Majors). Skip to the next section. The reception point is located ahead on entering the department and then to the left. The reception point is approximately 12m (13yd 4in) from the majors entrance. Clear signage for the reception area/desk is visible from the entrance. There is not sufficient space for a wheelchair user to use the waiting area. Vending machines are not available. There is not space for an assistance dog to rest within the seating area. You are on Reception (Resuscitation). Skip to the next section. The reception point is located straight ahead and then to the right. 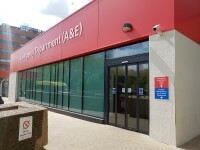 The reception point is approximately 11m (12yd 1in) from the resuscitation entrance. There is not a waiting area close to the reception point. You are on Counter (Registration Counters). Skip to the next section. 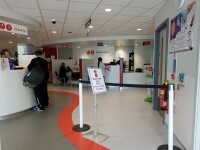 The Registration Counters is located to the right on entering the department. The counter is approximately 7m (7yd 1ft) from the Accident and Emergency entrance. The counter is clearly visible from the entrance. There is step free access to the counter. The lighting levels at the counter are medium. The height of the counter is medium height (77cm - 109cm). There is not a clear knee recess beneath the low section of the counter. Dementia friendly signage is not provided. 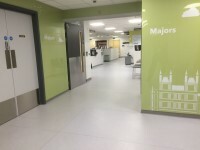 The type of flooring in walkways and corridors is vinyl/laminate. 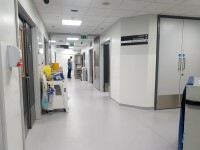 There is flooring in corridors which includes patterns or colours which could be confusing or look like steps or holes to some people. You are on Waiting Room / Area (Emergency X-Ray). Skip to the next section. 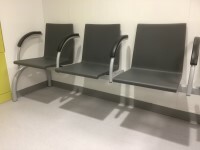 There is a waiting room / area. The waiting room / area is approximately 19m from the Accident and Emergency entrance. There is level access into the waiting room / area. There is not a/are not door(s) into the waiting room / area. There is not a space for a wheelchair user to wait within the seating area. All chairs are permanently fixed. 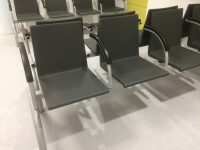 Some chairs with armrests are available. There is not a television. A water dispenser is not available. You are on Waiting Room / Area (Urgent Care). Skip to the next section. The waiting room / area is approximately 21m from the Accident and Emergency entrance. You are on Consultation / Treatment Room (Urgent Care). Skip to the next section. There is / are 10 consultation / treatment room(s) available. The name / number of the room surveyed was; Urgent Care. 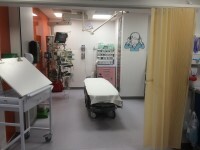 The consultation / treatment room is approximately 29m from the Accident and Emergency entrance. 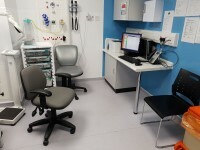 There is level access to the consultation / treatment room. There is a/are door(s) into the consultation / treatment room. The door(s) open(s) away from you (push). The door(s) is/are single width with a locked extension leaf. The width of the door opening is 90cm (2ft 11in). There is room for a wheelchair user to manoeuvre. There is a bed / couch. The bed / couch is adjustable. There is not sufficient space next to the bed/couch for a mobile hoist to operate. No chairs are permanently fixed. The chair(s) is not/are not adjustable. There are no chairs with armrests available. Some tables are permanently fixed. A hoist is not available. The room does not have background music playing. There is not a flashing fire alarm beacon within the room. You are on Consultation / Treatment Room (X-Ray). Skip to the next section. There is / are 1 consultation / treatment room(s) available. The name / number of the room surveyed was; X-Ray. The width of the door opening is 87cm (2ft 10in). There is sufficient space next to the bed/couch for a mobile hoist to operate. You are on Consultation / Treatment Room (Resuscitation). Skip to the next section. There is / are 8 consultation / treatment room(s) available. The name / number of the room surveyed was; R8. There is not a/are not door(s) into the consultation / treatment room. There is not a chair. There is a flashing fire alarm beacon within the room. You are on Accessible Toilet (Majors). Skip to the next section. 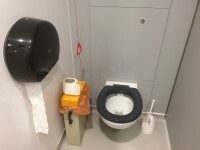 This accessible toilet is located to the right after the majors waiting area. 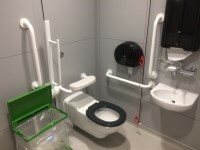 This accessible toilet is approximately 35m (38yd 10in) from the main entrance. The door is locked by a lever twist. 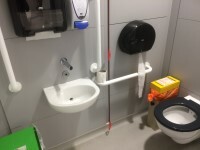 The dimensions of the accessible toilet are 210cm x 152cm (6ft 11in x 4ft 12in). 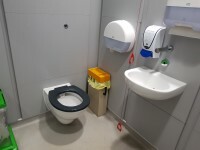 The accessible toilet does not have an unobstructed minimum turning space of 150cm x 150cm. The lateral transfer space is 140cm (4ft 7in). The lateral transfer space was obstructed at the time of the survey. There is a flush on the transfer side. There is a spatula type lever flush. There is an emergency alarm. There is a/are female sanitary, general domestic waste and clinical waste disposal units. There is a flashing fire alarm beacon within the cubicle. There is not a/are not coat hook(s). 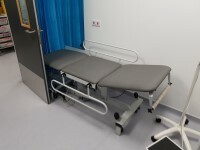 Wall-mounted grab rails are available. The height of the toilet seat above floor level is 46cm (1ft 6in). The height of the towel dispenser is 116cm (3ft 10in). There is a soap dispenser. The soap dispenser cannot be reached from seated on the toilet. 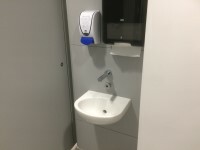 The height of the soap dispenser is 116cm. The wash basin cannot be reached from seated on the toilet. The toilet seat colour contrast is good. The shared toilets that were surveyed are located to the right on the main Accident and Emergency corridor. The shared toilet(s) is/are approximately 14m (15yd 11in) from the Accident and Emergency entrance. Inside the venue, there is level access to the shared toilet(s). You are on Standard Toilet(s) (Majors). Skip to the next section. The female and male toilet facilities that were surveyed are located to the right on entering the corridor leading to the majors entrance. The female and male toilets are approximately 18m (19yd 2ft) from the accident and emergency main entrance. You are on Standard Toilet(s) (Resuscitation). Skip to the next section. The shared toilets that were surveyed are located straight ahead on entering resucitation. The shared toilet(s) is/are approximately 18m (19yd 2ft) from the resucitation entrance. 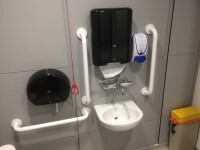 An ambulant toilet with wall mounted grab rails is available. You are on Related Access Guides. Skip to the next section. To view other DisabledGo access guides that are related to this one please use the links below. St Thomas' Hospital Main Entrance link (new tab) - click here.